The maximum temperature on Saturday was 35.0ºC (95.0ºF) and the minimum 24.6ºC (76.3ºF). The maximum relative humidity was 88 per cent and the minimum 49 per cent. Monsoon has been active in east Rajasthan. Rainfall: Rain or thundershowers have occurred at most places in east Rajasthan. The amounts of rainfall in cms are: East Rajasthan: Kapasan Dam 8, Aklera 7, Jhalawar and Sunel 6 each, Asnawar, Alniadam, Cholidam, Jalar Patan and Raipur 5 each, Bhilwara, Birawa, Kalisindh, Mandai, Mangrol, Panch Pahad and Pratapgarh 4 each, Anta, Arnod, Bhanwargarh Colony, Bakani, Digod, Dara, Kotri, Kota AP, Ladpura, Ramganj Mandi, Sawan Bhado and Umedsagar 3 each, Barisadri, Baran, Chotisadri, Gopalpura, Hurda, Indergarh, Kishanganj, Mandrai, Mandana, Narayan Sagar, Rajakhera, Sahabad, Sangod, Vagandam, Vardha Dam and Vijay Nagar 2 each and Ajmer, Bijolia, Chanda Ka Talab, Gulabpura, Keshorai Patan, Sapau and Talera 1 each, East Uttar Pradesh: Chhatnag 5, Fatehgarh 3, Bani 2 and Varanasi AP 1, West Uttar Pradesh: Kalpi 3 and Jhansi 1 and Uttaranchal: Banbasa 3. Forecast valid until the morning of Aug 19: Rain or thundershowers will occur at many places in west Rajasthan and south Uttar Pradesh, at a few places in Himachal Pradesh, Jammu and Kashmir, north Uttar Pradesh and Uttaranchal and at isolated places in the rest of the region. Heavy rain warning: Heavy rain is likely at isolated places in east Rajasthan and south Uttar Pradesh during the next 48 hours. 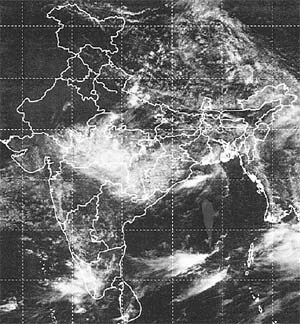 Forecast for Delhi and neighbourhood valid until the morning of August 19: Partly cloudy sky with possibility of rain/thundershowers in some areas. Farmers weather bulletin for Delhi: Forecast valid until the morning of August 19: Light rain is likely at a few places.